Maggots repulse us. Despite being the innocent babes of the insect world, there’s something about these larval critters that just gets under our skin. Yes, literally too. And dangerously. But there are good reasons we should overcome our aversion. It’s becoming increasingly clear how incorporating insects into our diets stands to benefit the environment – and even the maligned maggot could have an important role to play in a sustainable food supply. But to turn maggots into food, first they need to be efficiently well fed themselves. Figuring out the best way to do that is a challenge, since we don’t actually know an awful lot about how these swarms eat. As the researchers put it, these juvenile flies form a “fountain of larvae” – almost exactly like a beautiful spout of pristine, cleansing, flowing water… except made with a mountain of munching maggots. 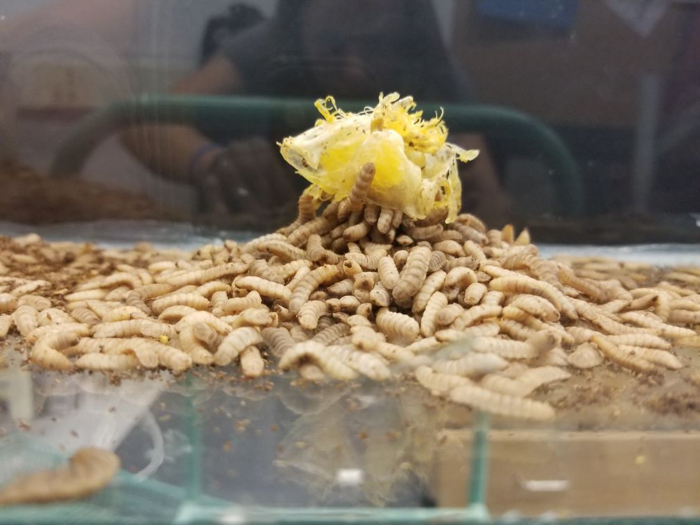 “Larvae push each other away from the food source, resulting in the formation of a fountain of larvae,” the team explains in their paper. This disgusting fountain solves what’s known as the ‘dog bowl problem’ (which limits the number of feeders who can access a common meal), and was observed in a number of varied feeding experiments. As far as we know, this bizarre fluid feeding arrangement could be a one-off in the animal kingdom, hypothetically making fly larvae “unique among scavengers”, as the researchers put it. “The ‘fountain of larvae’ may not be possible for other animal species,” the team explains. That’s understandable. People like enjoying meals together too. “Once larvae break through the crust, they consume the softer cheese rather than eating the rest of the crust,” the researchers write.